THAT, Akahi Wahine AKA GRACE AKAHI, is Her Royal Majesty/llighness Queen Akahi Nui Wahine, Queen of The Kingdom ofHawai'i Nation Sovereign Nation of God; And that the ACCUSED 1-6 including: Vanessa Fimbres, Nakoa Kaahunui, Kamalani, Kaahanui, Lokelani Nunes and Wayne Nunes are under and within the sovereign authority of His Majesty King Akahi Nui and the Kingdom of Hawaii Nation and stay/remain within the jurisdiction of same. 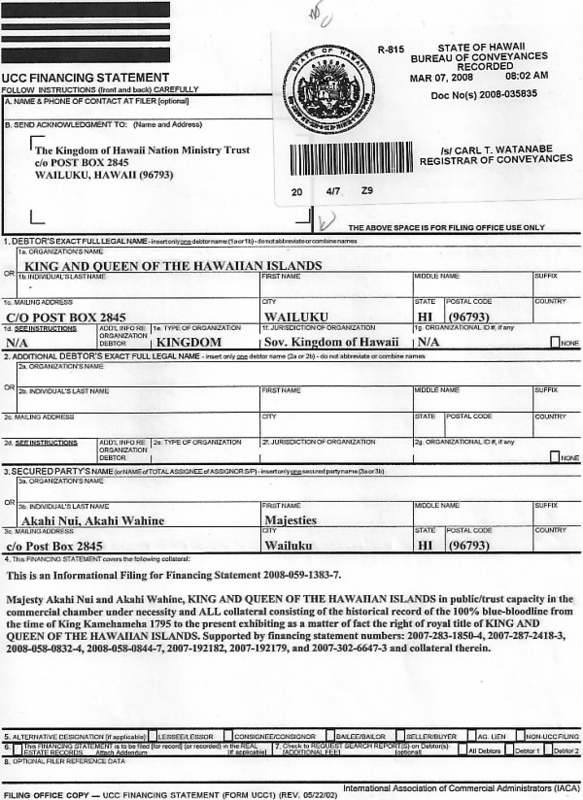 THAT, Akahi Wahine AKA GRACE AKAHI, is Queen to His Majesty King Akahi Nui, King of the Hawaiian Islands and as such has been recognized by the United States, Inc. (government) said recognition and comrrmati0I1 ~as the fact that her husband and King of the Hawaiian Islands, His Royal Majesty King.rahi Nui is a 100% Royal Blue Blood Lineal Descendant of Royal Sovereign Authority since 1778, said recognition and confirmation was committed and documented oh the March 12, 1998; And that the Accused 1-6 including: Vanessa Fimbres, Nak4 Kaahunui, Kamalani, Kaahanui, Lokelani Nunes and Wayne Nunes are under and within the sovereign authority of His Majesty King Akahi Nui and the Kingdom of Hawaii Nation and stay within the jurisdiction of same. THAT, Akahi Wahine AKA GRACE AKAHI has the right to challenge jurisdiction at any time during the proceedings and once challenged, the Court must prove lawful jurisdiction; And that the Accused 1-6 including: Vanessa Fimbres, Nakoa Kaahunui, Kamalani, Kaahanui, Lokelani Nunes and Wayne Nunes have all challenged jurisdiction and as such the above named remain within the jurisdiction of the Kingdom of Hawaii Nation and under the Sovereign Authority of His Majesty King Akahi Nui. 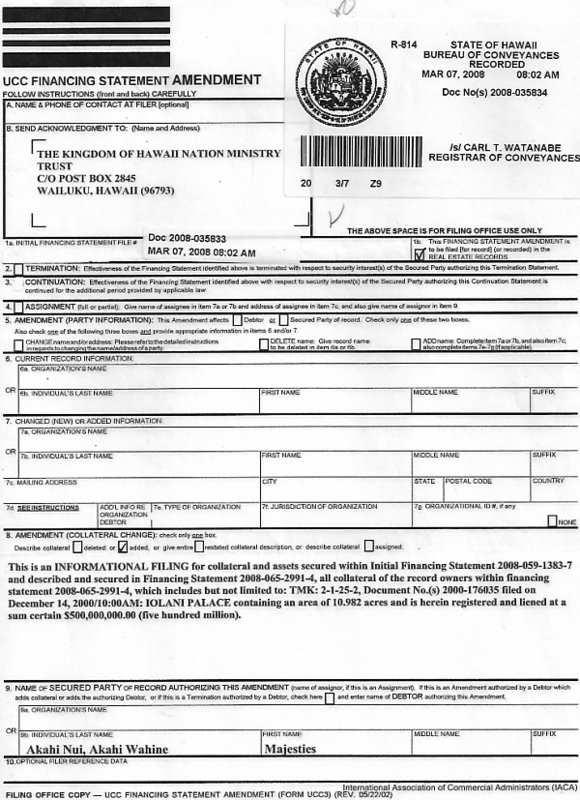 THAT, Akahi Wahine AKA GRACE AKAHI is the Royal MajestylHighness, Queen of The Kingdom ofHawai'i Nation Sovereign Nation of God and has no contracts with the State of Hawaii de-facto to bind the same to the de-facto jurisdiction of the this Court, which also includes ALL of the ACCUSED 1-6 and Vanessa Fimbres, Nakoa Kaahunui, Kamalani, Kaahanui, Loke1ani Nunes, and Wayne Nunes have no contracts with the STATE OF HAWAIl to bind us to the foreign jurisdiction of this court; this court is without jurisdiction over the ACCUSED and lacks authority over same. THAT, this Court is presumed NOT to be a Court of Constitutional Due process unless proven to be so by the head judge. 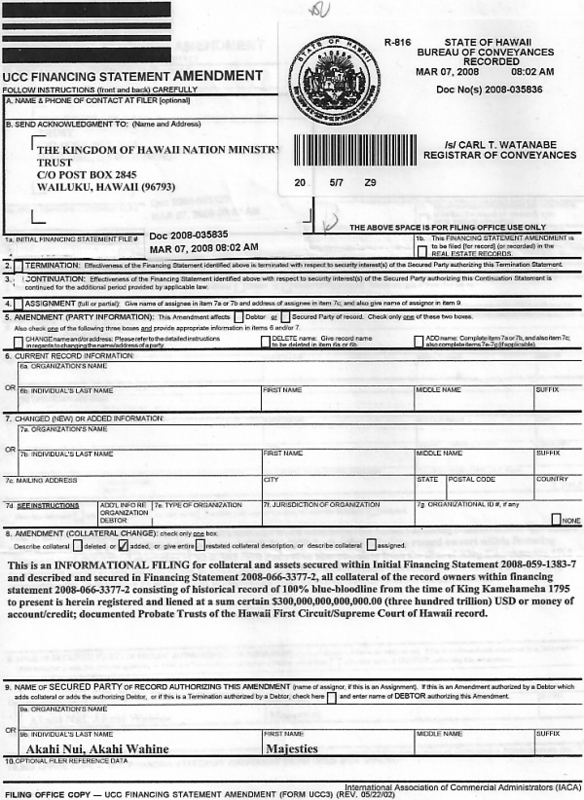 THAT, Akahi Wahine AKA GRACE AKAHI in her private capacity and in her Royal capacity is not named in the State Statutes of the de-facto State of Hawaii; and that Vanessa Fimbres, Nakoa Kaahunui, Kamalani, kaahanui, Lokelani Nunes, and Wayne Nunes in their private capacity and public are not named in the State Statutes of the STATE OF HAWAII and therefore, this court has no jurisdiction and the ACCUSED 1- 6/DEFENDANTS/Demandants are outside of said statutes and are outside of and not found within or under the de-facto military government - State of Hawaii (STATE OF HAWAIl INC), this court has no jurisdiction in this instant matter. 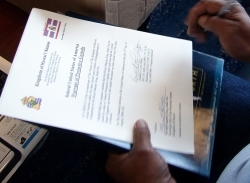 THAT, Akahi Wahine AKA GRACE AKAHI in her private capacity and in her Royal capacity is not a signatory to your State Constitution; That, Vanessa Fimbres Nakoa Kaahunui, Kamalani, Kaahanui, Lokelani Nunes, and Wayne Nunes in their private and public capacity are not signatories to your State Constitution. THAT, Akahi Wahine AKA GRACE AKAHI in her private capacity and in her Royal capacity is not a party to your social compact; and Vanessa Fimbres, Nakoa Kaahunui, Kamalani, Kaahanui, Loke1ani Nunes, and Wayne Nunes are not a party to your social compact. THAT, Akahi Wahine, Vanessa Fimbres, Nakoa Kaahunui, Kamalani, Kaahanui, Lokelani Nunes, and Wayne Nunes have never waived jurisdiction nor relinquished their position or actions from under the Sovereign Authority of His Majesty King Akahi Nui, King of the Hawaiian Islands. 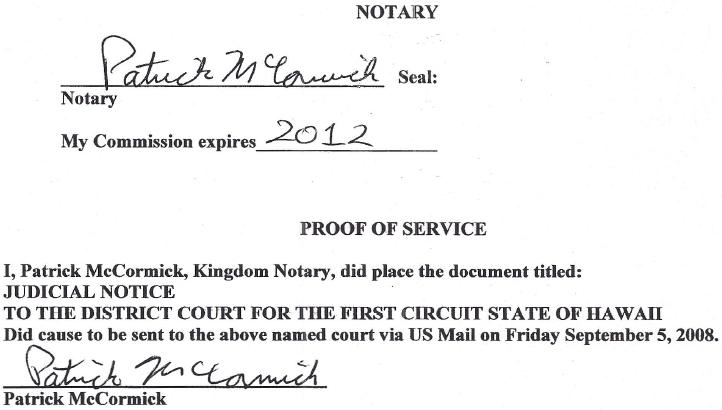 This court lacks jurisdiction. 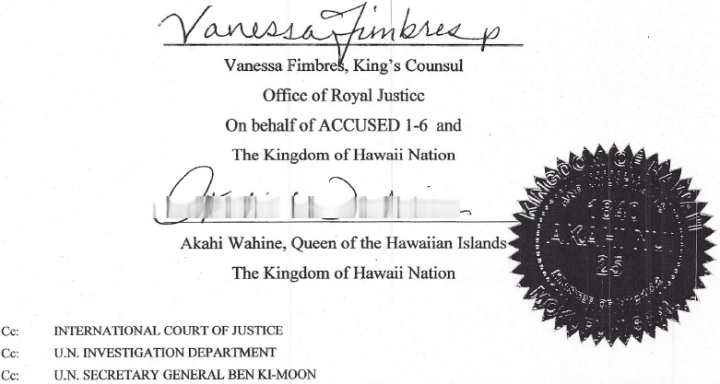 THEREFORE; Based upon the above facts, Vanessa Fimbres - Office of Royal Justice on behalf of Her Royal Majesty Highness Queen Akahi Nui Wahine and ALL ACCUSED in Matter (Arrest) No. : 08305312 named above, wherein His Majesty King Akahi Nui, The King of the Hawaiian Islands herein demands this Court, THE DISTRICT COURT FOR THE FIRST CIRCUIT HONOLULU DIVISION STATE OF HAWAII de-facto, to abate and dismiss all claims, charges or otherwise in the above instant matte I ab initio, under necessity, in the interest of justice and for lack of authority and jurisdiction.